Expiratory wheezing caused by the narrowing of a person’s trachea and, possibly, mainstem bronchi. As expiratory air rushes out through the narrowed trachea or mainstem bronchi, the wheezing sound is created. 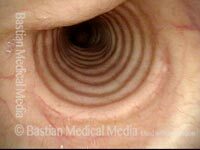 This tracheal narrowing and its accompanying wheezing can occur in a variety of circumstances or scenarios. 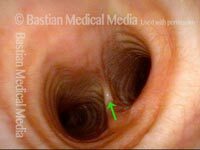 In the case of tracheomalacia, a person’s trachea is unusually flaccid and fails to stay open at its normal diameter. In other cases, there is no anatomical or physiological disorder of the person’s trachea, but the person is able, with a sort of semi-Valsalva maneuver, to flex inward the membranous tracheal wall and decrease the caliber of the “pipe.” Think, for example, of a “wheezy laugh.” This ability may have no particular significance to the person’s life, but in certain cases, a person may use an unusual degree of this wheezing ability to masquerade (perhaps sub-consciously) as having asthma: we call this nonorganic breathing disorder, tracheal. 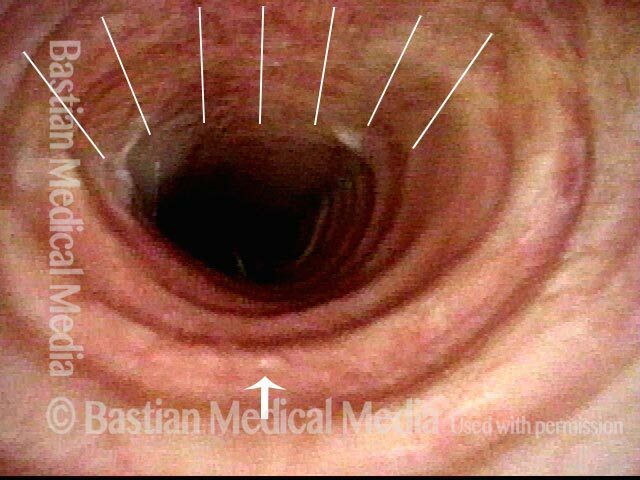 Finally, there are also cases in which a person who is grossly obese is susceptible to this momentary tracheal narrowing or collapse, because the added weight on the abdomen puts a kind of constant upward pressure on the diaphragm and serves as a kind of constant mild Valsalva. The patient is grossly obese. 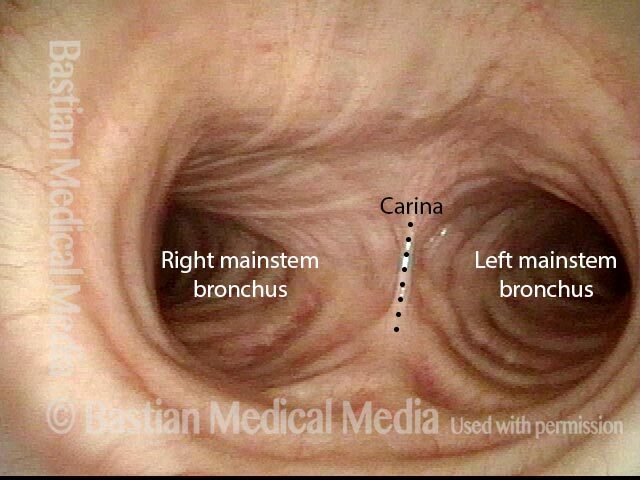 View of the distal trachea just above the carina, with both mainstem bronchi in clear view. An asterisk marks the anterior take-off of the carinal cord, to help compare this photo with photo 2. With vigorous exhalation, the membranous trachea bulges anteriorly and nearly blocks the mainstem bronchi. Loud wheezing is heard. 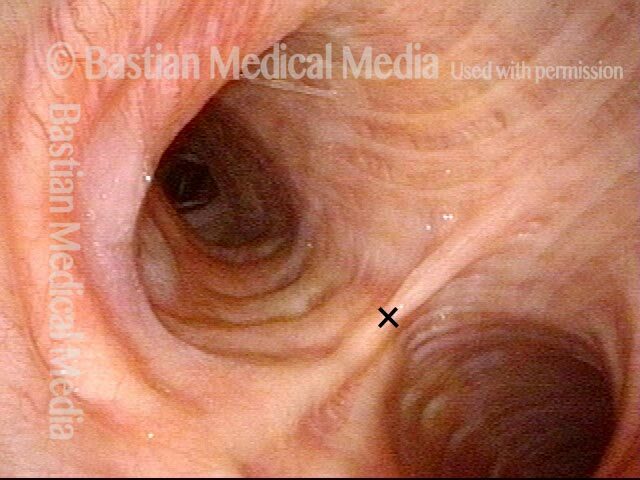 The pressure of this obese patient's abdomen makes his trachea vulnerable to collapsing, as here. Slightly closer view. Slightly greater bulging again shows nearly complete expiratory blockage of the mainstem bronchi. Committed expiratory lip-pursing mostly solves this problem. Vocal cords, in breathing position, in a person with wheezing who has been diagnosed elsewhere with asthma. Nothing seen here to explain the wheezing. Now descended into the upper trachea. As the patient performs (upon request) a semi-Valsalva manuever, one can see mild inward bulging of the membranous trachea (top-left of photo). This is not sufficient to explain the patient's wheezing. Descended further, into the mid-trachea, with the carina (dotted line) seen in the distance, as the patient breathes quietly. Same view as photo 3, but during another semi-Valsalva maneuver. The membranous tracheal wall bulges inward again, but much more noticeably here than in the upper trachea (photo 2), especially down by the carina (which is now hidden from view). Down further yet, almost to the level of the carina (dotted line). On each side is the entrance to each of the mainstream bronchi. Same view as photo 5, but during another semi-Valsalva maneuver. The membranous tracheal wall bulges inward again to partly block the airway, especially the right mainstem bronchus. 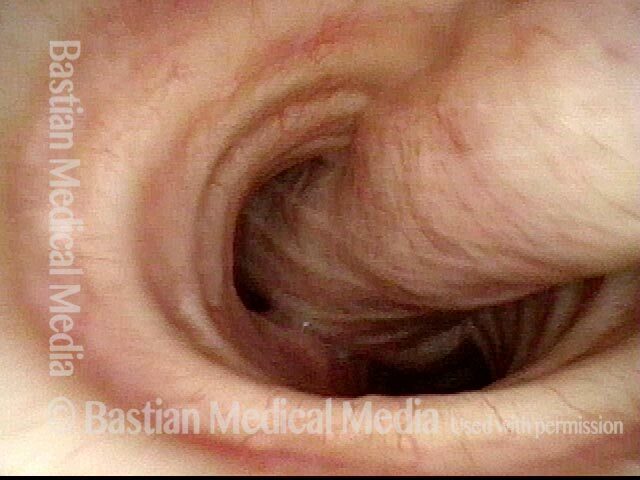 This patient's wheezing sounds loudest over the sternal notch and manubrium; softer wheezing is also heard in the distal lung fields, and as expected from this photo, is louder on the right than the left. Further down yet, now looking directly into the right mainstem bronchus. Same view as photo 7, but during another semi-Valsalva maneuver. Note compression as well of lobar bronchi, also partly responsible for the patient’s wheezing. 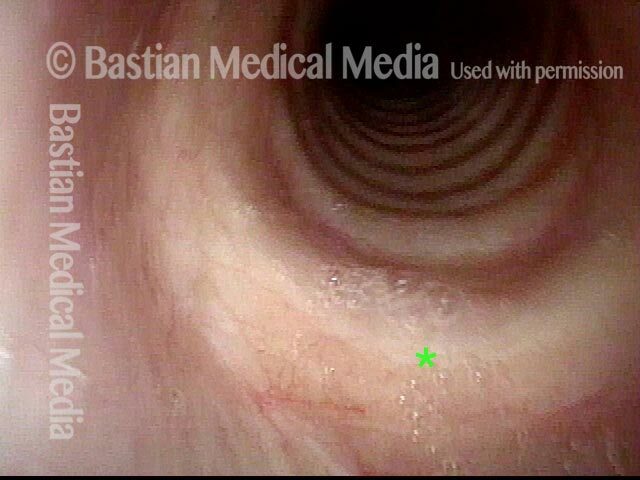 Even at its maximum functional caliber, this trachea is severely narrowed (stenotic), due to injury from long-term intubation and tracheotomy. 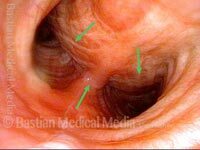 Not yet visible here is the tracheomalacia component (illustrated in image 2). A small granuloma is also visible on the right edge of the image. Additional functional collapse (the tracheomalacia component), with both inspiration and expiration. Distal trachea, showing the carina (middle arrow), where the trachea (or windpipe) divides into the two mainstem bronchi. The membranous tracheal wall is flexible, and beginning to bulge forward functionally (under patient control). 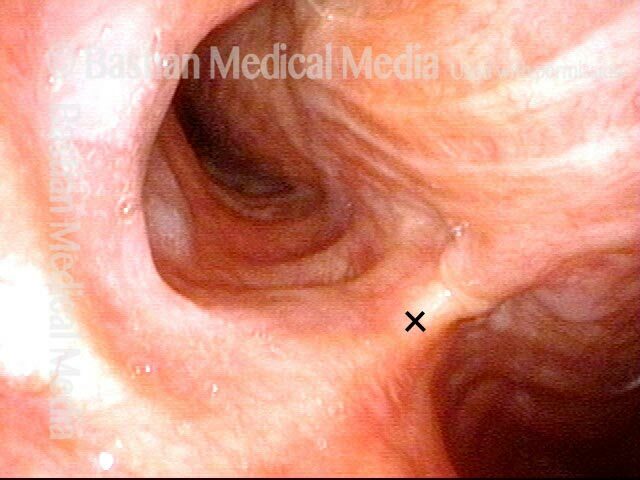 On expiration, there is anterior bulging (arrows) of the tracheoesophageal party wall, to the point of largely obstructing the mainstem bronchi. Air moving through this functionally narrowed space can cause wheezing on a non-organic basis. Wheezing will be much louder with auscultation over the manubrium, than on listening in the peripheral lung fields. Distal trachea, where it splits into the two mainstem bronchi. Arrow at speck of mucus is just for reference to photo 2. 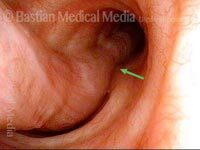 The patient is coughing at this moment, and the membranous tracheal wall bulges to partially block the trachea, causing a wheezing component to the sound of his cough. This tracheal physiology is seen to some degree when virtually everybody coughs, and it helps to speed the velocity of air exploding upwards from the lungs as it must pass through the narrowed segment. 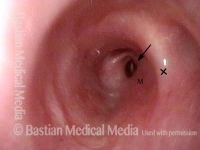 View of the distal trachea in a patient with nonorganic “asthma.” An arrow marks the location of the carina; note how, at this moment, the mainstem bronchi to each side are widely opened. Wheezing. (Arrow still at the carina.) One can see that the cause of the wheezing is functional manipulation of the distal trachea, in this case mainly the left mainstem bronchus (right of image); hence, the wheezing is louder over the lung on that side than the other side. Also, unlike with true asthma, the wheezing is much louder over the manubrium than either of the peripheral lung fields. 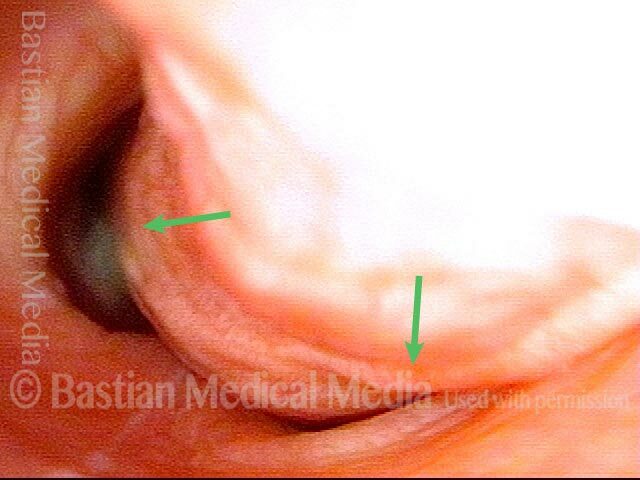 View of the distal trachea at the carina (where the windpipe divides into the right and left mainstem bronchi). Orienting arrow at the base of the carina. 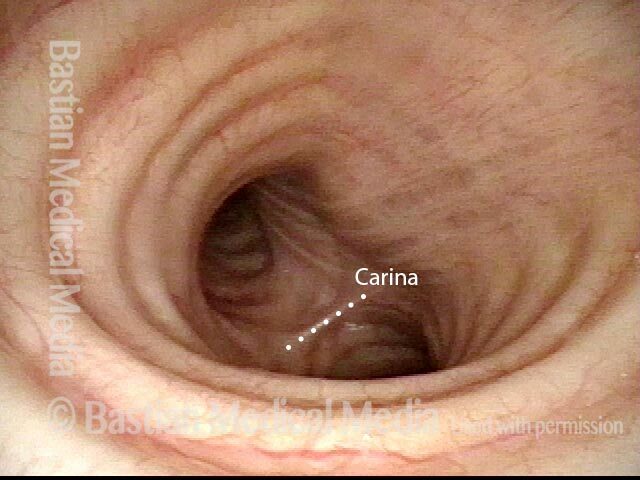 Further down still, viewing the distal trachea; an arrow marks the carina. The source of the wheezing now becomes evident: the take-off of the right main stem bronchus (left of image) is extremely abnormal and narrowed. The left main stem bronchus appears to have a subtle stenosis, which is a red herring. 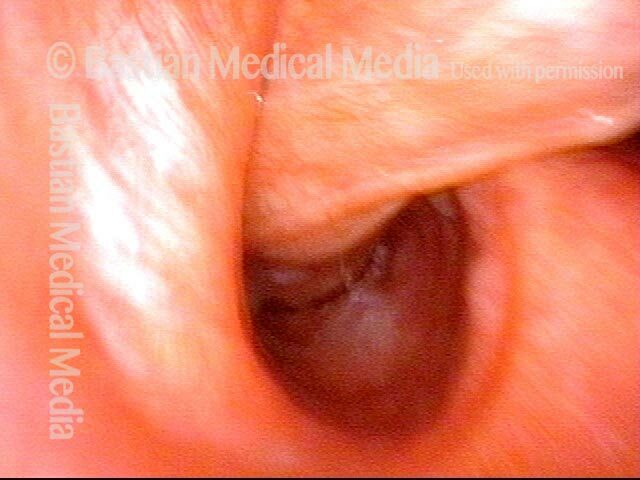 Close-up on the abnormal take-off for the right main stem bronchus, which should be wide open. Instead, there are accessory bronchi exiting what is probably a congenital malformation. A dotted line indicates the expected size of this passageway, were it not malformed. This patient has noticed faint wheezing for most of her life. 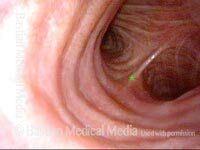 Here is a panorama of the entrance to her larynx, which is normal—wide open and unobstructed—and does not yet explain her wheezing. 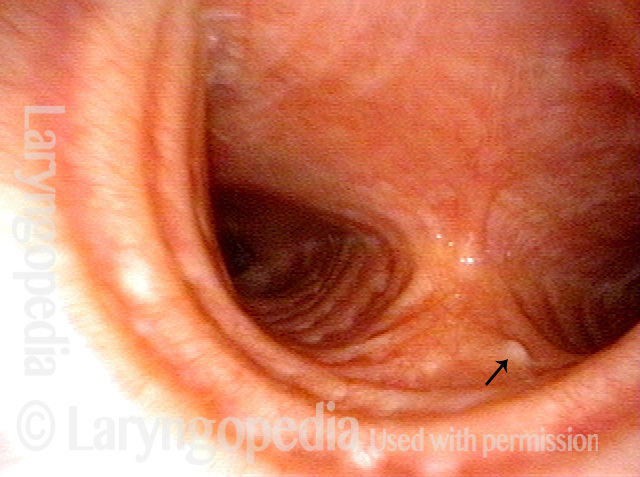 For reference, an asterisk marks the upper surface of the cricoid ring. Further down, now just below the vocal cords; an asterisk again indicates the anterior cricoid ring. The upper tracheal rings here are normal. Still no explanation for her wheezing. Further down yet, now into the mid-trachea. Still no sign of any anatomical cause for the wheezing. This patient has COPD as well as a "wet and productive" sounding cough. The explanation for this is not actual mucus, but tracheal vibration that sounds like a mucus-y cough. This panoramic view shows inspiration and normal abduction of the vocal cords. As we will see in photo 3, the trachea is patent at this moment. 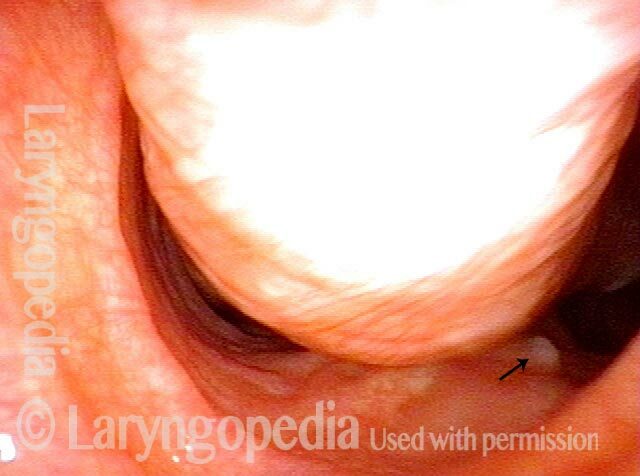 Expiratory partial closure of the true vocal cords, similar to the lip-pursing maneuver persons with COPD often use to prevent lower airway collapse. As we see in photo 4, collapse is happening in spite of this lip-pursing maneuver. Mid-trachea during deep inspiration, corresponding to the vocal cord position in photo 1. 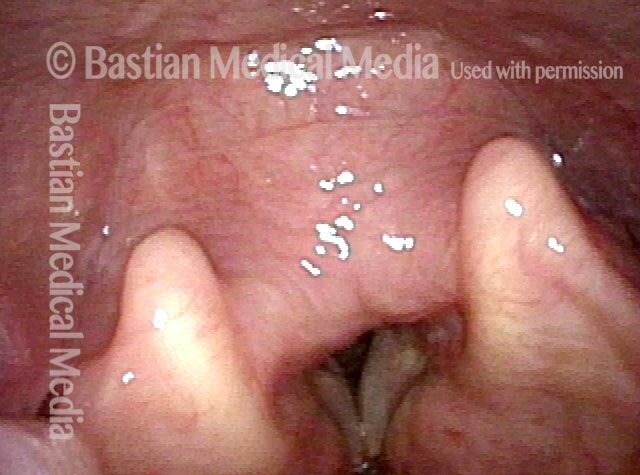 The white arrow indicates a speck of mucus which will also be seen in photo 4. 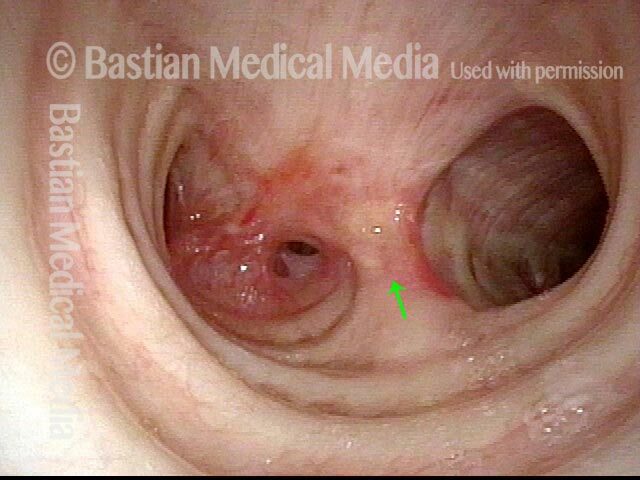 Mid-trachea, showing the same position as photo 3 but now during expiration. The membranous tracheal wall is bulging inward and nearly blocking the trachea. A wheezing sound is heard as air whistles though this narrow lumen (the expected lumen is indicated by the curved dotted line). 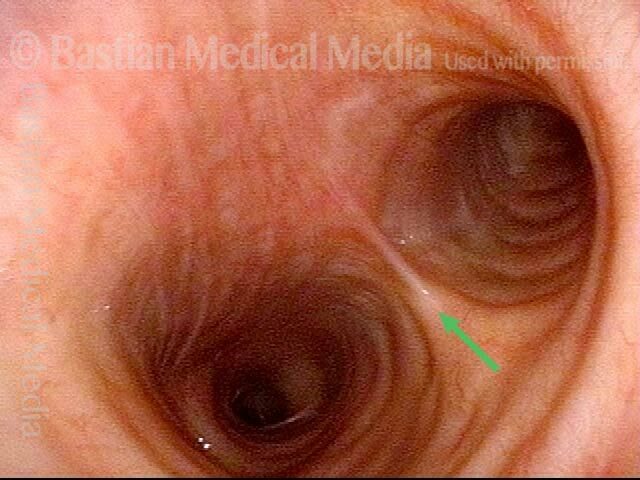 The same speck of mucus that was seen in photo 3 is indicated again by the white arrow. A little farther down the trachea, during inspiration. At the same position as photo 5, during a cough. 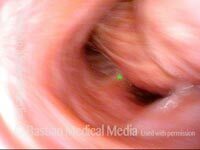 The membranous trachea not only bulges inward, but it also vibrates impressively (note blur), creating a deep and rumbling cough whose "wet" quality is not actually from mucus, but from vibration of the tracheoesophageal party wall. A person in hospital for a week of every month, with inconsistent and underwhelming response to powerful medical management. During quiet breathing, we see open trachea and bronchi, and hear at most, scattered wheezing on lung exhalation. Carina marked with 'X' for orientation with next photo. Effortful exhalation, as requested by the examiner. The membranous bronchial walls bulge inward on an elicited functional basis and dramatically increase the audible wheezing, which is quieter in peripheral lung fields than at sternal notch/ manubrium. Expiratory straw breathing, and CPAP both markedly diminish the wheezing. 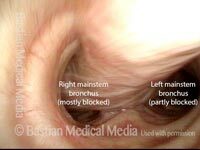 Left mainstem bronchus narrowing due to elicited and functional bulging of the membranous bronchial wall. 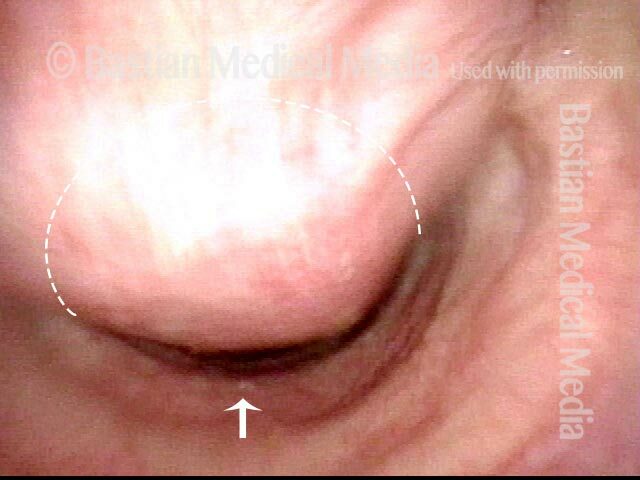 The same phenomenon as in photo 3, but seen in the right mainstream bronchus. The patient can wheeze loudly upon request. Auscultation reveals that wheezing is much louder at base of neck than over lung fields. As shown here, membranous trachea can be functionally / volitionally intruded to the lumen, but not sufficiently to cause the patient’s wheezing. The mainstem bronchi do not seem sufficiently narrowed to cause her loud wheezing either. The source of wheezing is not yet seen. Viewing from deep within the right mainstem bronchus, while breathing in, the opening to lobar bronchus (arrow) seems appropriate. "M" indicates membranous bronchus, for comparison with the following photo. When asked to exhale forcefully and volitionally wheeze, this lobar bronchus (and others not shown here) is nearly closed by bulging of the membranous bronchus, again indicated by “M.” Eureka: wheezing is originating at the level of lobar bronchi, rather than at carina or trachea. The patient’s asthmatic wheezing appears to be amplified by functional and possibly volitional lobar bronchial narrowing. Expiratory straw-breathing effectively eliminates her ability to wheeze. This entry was posted in Multimedia Encyclopedia and tagged Airway disorders, Disorders, Photos by admin. Bookmark the permalink.